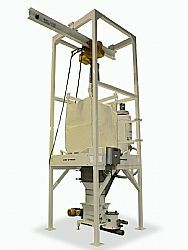 VAC-U-MAX Bulk Bag Discharger for pneumatic conveying systems. The Bulk Bag Unloader provides a clean, and efficient way to discharge the entire contents of a bulk bag and is specifically designed for semi to Non-Free flowing powders. VAC-U-MAX Bulk Bag Dischargers use our proprietary pneumatically operated massage paddles, operator access door for a complete sealed system, integral dust collector, heavy duty tubular frame, motorized hoist and trolley, screw discharger for controlled metering of powders into the convey line or process. For more information on VAC-U-MAX Bulk Bag Unloaders and Dischargers please visit www.vac-u-max.com or call 800-VAC-U-MAX (822-8629).